Two new resources are available for providers who work with patients with complex care needs. One is a report from the Six Foundation Collaborative, made up of The Commonwealth Fund, The John A. Hartford Foundation, Milbank Memorial Fund, Peterson Center on Healthcare, Robert Wood Johnson Foundation, and The SCAN Foundation. How ACOs Are Caring for People with Complex Needs demonstrates that accountable care organizations have increased their efforts to target populations with complex care needs but more needs to be done to implement approaches to improving care delivery. 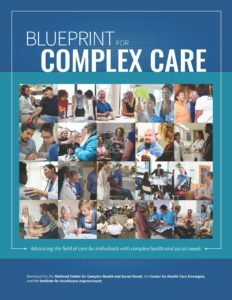 The second report, The Blueprint for Complex Care: Advancing the Field of Care for Individuals with Complex Health and Social Needs, provides a strategic plan to support multidisciplinary innovations and to accelerate opportunities to improve care for individuals with complex health and social needs. The report, also supported by the Six Foundation Collaborative, is a joint project of the National Center for Complex Health and Social Needs, the Center for Health Care Strategies, and the Institute for Healthcare Improvement. Learn more about these reports and the work of the Six Foundation Collaborative.